Because beauty is timeless, both traditional and contemporary quilters appreciate antique quilts as a source of inspiration for their work. The nine full-sized quilts in this book scan more than a century and were selected from hundreds of antique quilts because of their striking designs. Whether made from reproduction or today�s fabrics, they�re sure to maintain a classic look. All of the quilts are pieced with one has simple curved piecing. Included is a Live Oak Tree design that is pieced with diamonds like a Lone Star design. 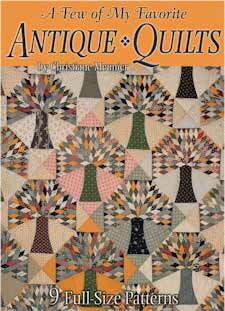 A striking Log Cabin and a Little Red Schoolhouse pattern are part of this interesting book. The Circle Design would make a stunning quilt done in bright colors and maybe batik fabrics. The choices would be endless. The instructions are complete and the illustrations clear, and the quilt designs are exciting. Hurricane Katrina and "Quilts to the Rescue"